Epcot Illuminations is one of the things which really should be on everyone’s must see list when they go to Disney World. Illuminations Reflections of Earth plays out every night at Disney’s Epcot around the World Showcase Lagoon. Epcot Illuminations is a unique blend of fireworks,music, lights and pyrotechnics. Prepare yourself for one of the best fireworks shows you have ever seen. “Good evening. On behalf of Walt Disney World, the place where dreams come true, we welcome all of you to Epcot and World Showcase. We’ve gathered here tonight around the fire as people of all lands have gathered for thousands and thousands of years before us… to share the light… and to share a story. An amazing story as old as time itself, but still being written. And though each of us has our own individual stories to tell, a true adventure emerges when we bring them all together as one. 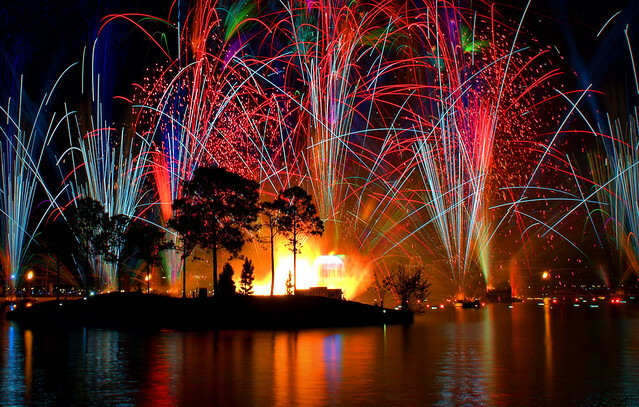 We hope you enjoy our show tonight:Reflections of Earth”. 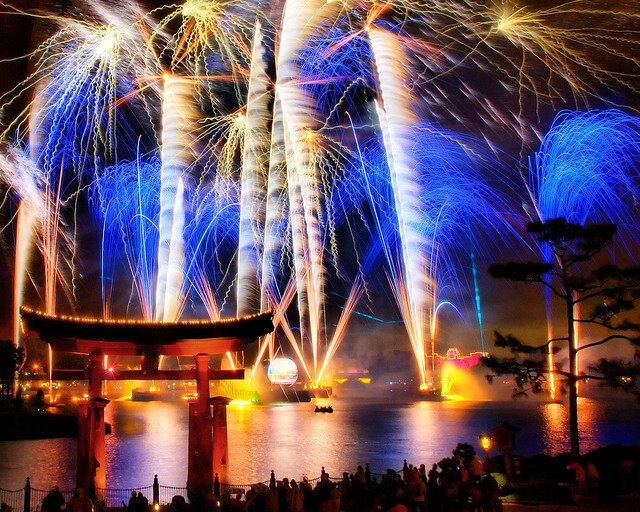 What is the Story of Illuminations Reflections of Earth? After what sometimes seems like a lot of anticipation the lights around Epcot go dim. Then a single firework shoots across the World Showcase Lagoon from the United Kingdom Pavillion. The start of the Epcot Illuminations fireworks is used to represent the Big Bang and the creation of the Universe. Then things become a little more calm with scenes evoking the nativity of the earth. After this spectacular introduction the mood changes with a more sedate tempo and the beginning of the journey of the huge globe across the World Showcase Lagoon. This is a 350,000 pound globe on a barge! Difficult to explain what this looks like but it is certainly unique and innovative. Images are projected on to the globe to give the illusion of a floating earth. The display uses almost 300 LED screens to project images depicting the earth from the dinosaurs to present day. Personally I know this is very clever but this is the part of Illuminations that is a little slow for me. Not much is going on and usually I just want the fireworks to start again! The globe then opens out, signaling the finale of pyrotechnics and fireworks. This is the part of the story which symbolizes a new age and a new beginning. Illuminations makes use of lasers in the display. For those of you who like Disney trivia here is an interesting one for you. THE FAA has to grant advance permission for any system using lasers outdoors. This means that every night Orlando International Airport has to be notified when Epcot Illuminations starts so that air traffic control can be advised. How Do I Decide Where to View Epcot Illuminations? The first thing you need to do is decide how you are going to leave the park after Illuminations! Epcot closes when the final firework has left the sky. You will soon realize that up to 30,000 people will be leaving at the same time that you are. So you need to decide how important it is to you to leave the park quickly and balance that against where your ideal or available viewing spot is. If you are not in a rush to exit the park then simply decide where you would prefer to view and be prepared to stake out popular spots ahead of time! Most people will exit through the main entrance rather than through the World Showcase exit. If you are exiting through the main entrance then the closest place to the exit around the Lagoon is either near Canada or Mexico. If you are a guest at one of the Disney Epcot resort hotels then to exit more quickly you may want to be close to the World Showcase exit located between France and the United Kingdom. If you aren’t concerned about getting out of Epcot quickly then you have a lot more scope as to viewing spots. Personally I don’t like to rush out of the park. Take the chance to sit down for 10 minutes or so until the crowds start to thin out. One of my favorite spots to just relax and take in the atmosphere is close to the fountains in France. Where are the best places to view Epcot illuminations? Most places give a decent view. Just watch out for trees which may block your view! However, some spots are definitely the good ones. Be aware that at busier times these great viewing spots will be reserved an hour or two in advance.Personally I would not do this – but if this is your one shot at seeing the show then you may decide you want to. If you can snag a table near the window this is a great spot to view – and you can be in comfort actually sitting down! 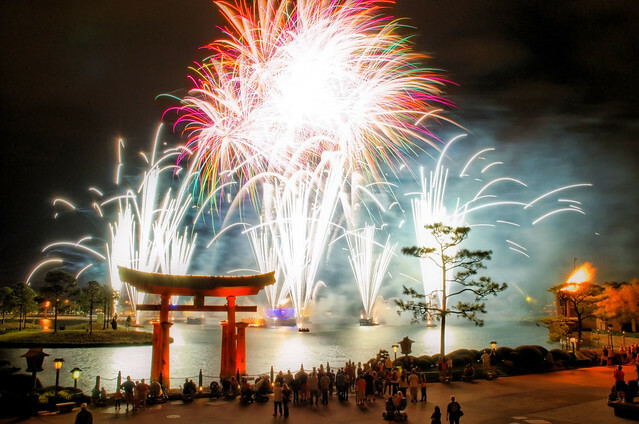 Make your Advance Dining Reservation for around 45 minutes to one hour before Illuminations starts and ask for a table where you can view the fireworks. Even if you don’t get a great viewing table then one thing you can do is eat in the restaurant and stay until show time – the staff will usually help you find a good viewing spot outside. This gives you a very close view of the pyrotechnics and it does get surprisingly warm! This is one of the most intense viewing places. Possibly the most popular viewing spot. It gives a great view and easy access out of the park after the end of the show. Even at slow times this one is going to fill up first. Again this has the advantage of being able to sit down (if you get there early enough). This is a counter service restaurant so you don’t need reservations. If you get there early enough to get a place on the raised viewing platform outside the restaurant then this is a great viewing place. A great view with an easy route out of Epcot if you are taking either the World Showcase or Future World exit. This is ideal if you are going to exit through the World Showcase exit. Would you like to know a very special way of viewing the Epcot Illuminations fireworks? Well for those looking for a unique experience how about booking the Disney Epcot Illuminations Cruise? These cruises do book up early. 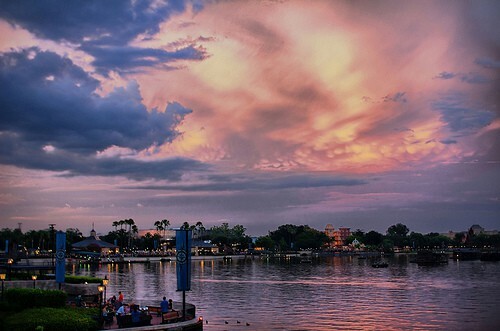 To reserve call 407-WDW-PLAY, between 7 a.m. and 10 p.m EST up to 180 days in advance. You have to give a credit card guarantee and your card will be charged unless you cancel 24 hours in advance. Each boat will be positioned under the International Gateway Bridge and you will get an amazing view of Illuminations. Guests do report that this splurge really is worth it. Another way to buy yourself a good view of the Epcot fireworks is to book the Frozen Ever After Dessert Party. The price is $79 for adults and $47 for children aged 3 to 9. This Frozen themed party replaced the Epcot Illuminations Sparkling Dessert party back in July 2017. The location is excellent for viewing Epcot Illuminations – close to the Canada and Mexico Friendship boat launch. It isn’t just for those with a sweet tooth. One of the best items is the Duke of Weselton’s cheese fondue served with country bread cubes, broccoli and grilled flatbread. As well as securing a good viewing spot, you will also be given a very coveted thing. The chance to ride Frozen Ever After following the party. You will be escorted to the ride after Illuminations and you will ride with your fellow party attendees. As Frozen Ever After has one of the longest lines and is one of the most difficult to get Fast Passes in the whole of Walt Disney World this is a big perk. The great thing about the Frozen Ever After Dessert Party is that you will get to sit down whilst waiting for Illuminations to start! There are plenty of tables with chairs. You are allocated a table according to the size of your party and how far ahead you booked. The further in advance you book the more likely you are to get one of the best tables by the edge of the World Showcase Lagoon. Wherever you view Epcot Illuminations Reflections of Earth you are sure to appreciate this spectacular display. Make sure that you plan to see it at least once on your visit to Disney World.